Summary: How can a site communicate information to stakeholders more effectively and ensure continued support? This example of a site impact report by the Oklahoma Writing Project shows one way. Data from the NWP Site Profile System and other information sources were compiled to showcase the impact of site programs. This newsletter/report was then distributed to university partners and the local educational community. Site leaders can use this model to consider how to make the case for their own site. 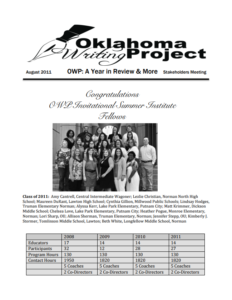 When OK Oklahoma WP convened a stakeholders’ meeting to discuss its funding future, participants viewed a report showcasing the impact of OWP’s professional development, continuity and outreach programs. Open the Stakeholder Report to view how this site made an effective case for funding its writing project.